The Binge Eating and Compulsive Overeating Workbook : An Integrated Approach to Overcoming Disordered Eating is written by Carolyn Ross, M.D. This book is designed to help those that have a problem with binge eating disorders to heal their destructive relationships with food and regain control of their lives and health. It covers the underlying causes of binge eating and will help you to determine how certain foods and different emotions can trigger overeating. 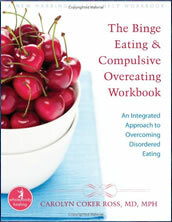 This workbook provides practical solutions for those who struggle with binge eating and compulsive overeating. Firstly binge eating and compulsive overeating are defined so that readers can understand and recognize these conditions. Ross then takes the reader through a series of quizzes and exercises that are intended to increase awareness of negative patterns so as to open a path for healing to occur. You will learn to identify the role of trigger foods, emotional imbalances, stress, depression and anxiety. You are encouraged to examine your ideas about ‘good’ and ‘bad’ foods and to realize that all foods have potential good and bad qualities. For example, chocolate can be seen as a bad food due to its high content of sugar and fat but dark chocolate that contains over 60% cocoa can actually have beneficial effects on health when consumed in moderation. A major element of the Binge Eating and Compulsive Overeating Workbook involves learning how to deal with stress. Stress management and relaxation techniques are introduced that will help you to find ways to cope with stress that do not involve food. Fruit, vegetables, oatmeal, whole grain bread, pasta, shrimp, fish, chicken, eggs, avocado, walnut, flaxseed, peanut butter, milk, yogurt, tofu, beans, dark chocolate. The major focus of The Binge Eating and Compulsive Overeating Workbook is on nutrition and avoiding overeating. While Ross discusses the role of physical inactivity in increasing rates of obesity she does not offer any guidance for exercise in this book. The Binge Eating and Compulsive Overeating Workbook : An Integrated Approach to Overcoming Disordered Eating retails at $21.95. Provides unique information that specifically applies to those who have a problem with binge eating. Teaches dieters how to deal with trigger foods and emotions that may cause overeating. Addresses the root cause of weight gain rather than providing just a temporary solution. Acknowledges the importance of stress management. Less expensive than undertaking counseling sessions. Educates readers about basic nutrition. Author is a medical practitioner. Will not apply to readers who do not suffer from binge eating. Does not address the importance of exercise for weight management. The Binge Eating and Compulsive Overeating Workbook will help those who struggle with these issues to learn to appreciate and accept their bodies. Unfortunately Ross fails to mention the importance of exercise for health and readers may overlook its potential benefits for weight management and emotional balance. Nonetheless this book offers a great deal of practical advice that will greatly improve your ability to manage stress and will help you to replace unhealthy habits with behaviors that will support and nourish both your body and spirit.